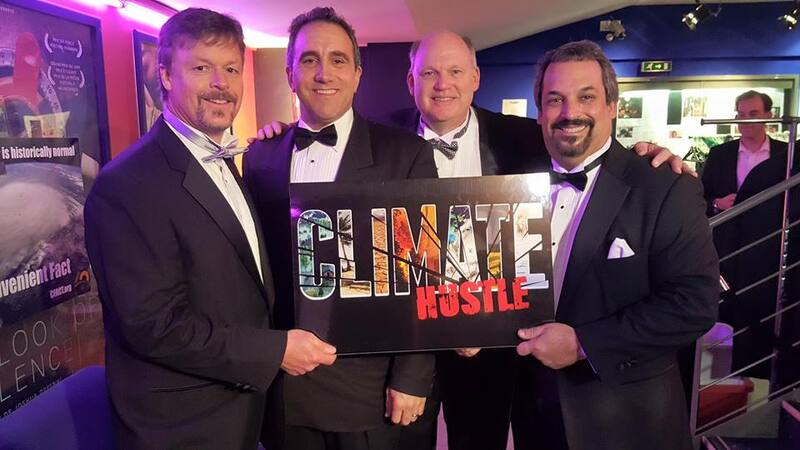 The historic Cinéma du Panthéon in Paris was sold out Monday night as CFACT held the gala, red-carpet world premiere for its highly anticipated new film, Climate Hustle. 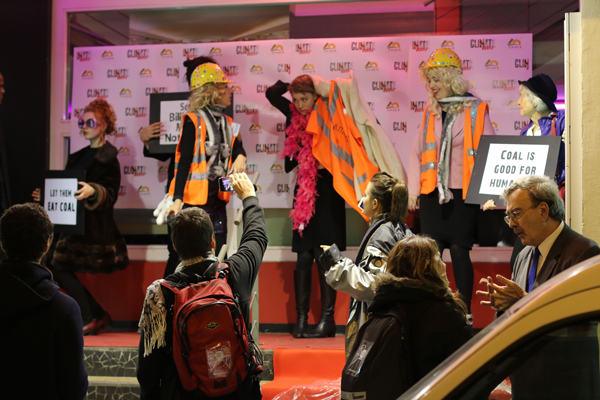 A raucous band of protesters showed up, including women dressed as coal miners who danced and sang, men dressed as howling spoons (we’re still figuring that one out) and the more usual band of drab and dreary leftists. The film’s host, Marc Morano, pedaled up to the premiere in black tie on bicycle. He dismounted, joked, bantered and good-naturedly posed for pictures with the demonstrators. However, as the crowd swelled and the demonstrators became more raucous, French police arrived, cleared them out of the way and moved them across the street. 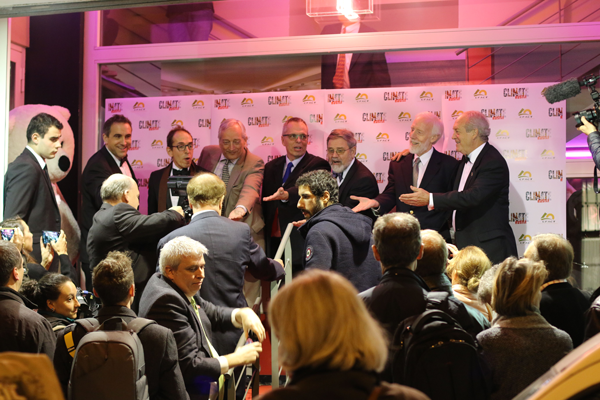 With order restored, Morano walked the red carpet, followed by the executive producers, CFACT president David Rothbard and executive director Craig Rucker, and producer/director Chris Rogers of CDR Communications. The evening began with a Parisian reception featuring wine, cheese and hors d’oeuvres. The crowd moved into the theater and after some welcoming remarks the lights went down and the film, subtitled in French, began. Very quickly the theater was filled with ongoing laughter and applause indicating Climate Hustle had hit its mark. The Climate Hustle project is something new and different in the global warming debate. It couples a deep bench of scientific knowledge with humor and light touches. 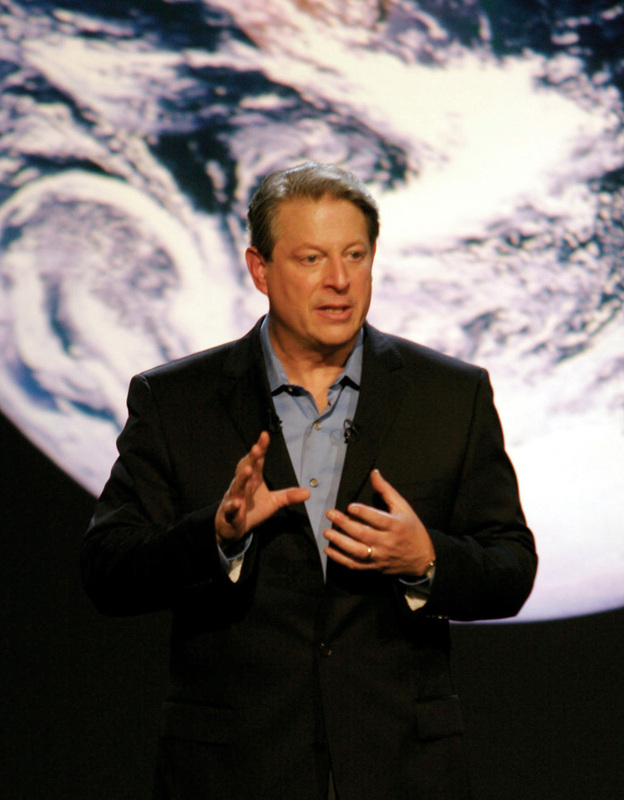 The film showcases a lengthy history of contradictory, often hilarious pronouncements straight from the mouths of global warming proponents and their complicit media. As the talking heads of the climate alarm movement solemnly go from ice age to warming, then intone that global warming will cause less rain, more rain; less snow, more snow; less storms, more storms; and everything under the sun, ad nauseum, you’d have to have a heart of stone not to laugh. That is the essence of the global warming hustle. Alarmists have created a narrative that can’t be falsified. No matter what occurs, team warming solemnly intones it is all caused by global warming and is all your fault. Of course, anyone following along with an open mind quickly realizes, as CFACT’s French audience did, that all of these contradictions can’t exist together. They’ve been had. Once you’re in on the joke, laughter’s a natural. That’s why global warming campaigners fear this film. Once the open-minded observer sees for himself that the emperor has no clothes, they can’t “unsee” it. 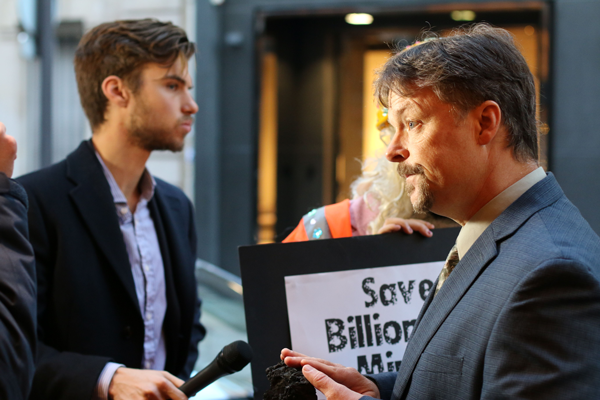 The Climate Hustle premiere has been making quite a splash with the press, already appearing in the New York Times, Breitbart, Reuters, Politico, The Washington Times, E&E News, Fox News, NewBusters, The Irish Times, Daily Caller, The Australian, Canada Free Press, Executive Intelligence Review, USA Today, Examiner.com, News-Press, The Blaze, Daily Kos, The National Observer, and others. Well done all. Wish I’d been there but can’t wait to see. Will the film be available on the internet? Maybe pay-walled or something. I think that most theaters won’t offer it (a financial thing). A cable television broadcast might garner quite a bit of interest. I JUST WANT TO SEE IT! On the plus side Thomas, at least you can now say that someone has reviewed it. On a lighter note, did you see Ice & Sky, now that one did actually get some reviews, and pretty good ones too. I assume you had a very good reason for publishing a photo of an empty theatre. At least we’re honest, even when we make a mistake we admit it. Patrick Moore, well I’m quite touched, though if I’m being honest I thought you would be quicker on the uptake, Thomas certainly was. I was expressing reservation about the small size of the cinema for such a prestigious denial lobby event. Thomas was concerned that the photo didn’t show the cinema properly so I added a section and seat count, a world shaking 162(? ), of whom a certain number where paid attendees: speaking of which Patrick, who paid for your jolly to Paris? If that were a true statement, you’d be ceaselessly babbling apologies for the rest of your days. Patrick, how did you manage to get all your comments under Tom Harris’ Feb. 15 Washington Times article deleted? Embarrassment avoided. Good trick. Who cares what a fossil fuel industry shill thinks? I am not a fossil fuel industry shill. But I do support inexpensive energy. You do not, I assume. You must be a wind energy industry shill. And you just “happen” to create propaganda for them… in the form of Op Ed pieces for every (usually small time these days) paper and blog you can get your garbage published in…. I could go on for pages with this stuff. The funny thing is to look around see what you write, and connect it together. In one entry you will deny that climate change exists, cherry picking some minutia as “evidence” and then in the next paper you will acknowledeg it exists, but expound that the cure is to costly, only to go back in the next paper denying it exists again. It is pretty disgusting to watch you roam the interwebs doing it, preying on various groups, hoping to take advantage of ignorance and politics. Do. The movie is a documentary, and has a number of very revealing interviews of Tom’s cohorts. Disgusting, but elightening. small and certainly not a threat to anybody. Try telling that to the people of the North of England and Scotland after record breaking rainfall caused devastating floods. Oh, and this link is to an article discussing the relationship between the flooding and climate change. Do you honestly believe “North of England and Scotland” are representative of global trends? Sheesh. – For decades scientists have been presenting a clear and consistent case regarding climate change. – For decades scientists have been warning that we can expect ever more extreme weather events. – For decades an aggressive denial lobby has been telling us that scientists are liars and there is nothing to worry about. – For decades an aggressive denial lobby have been put forth nothing more than endless rebuttal. – And now people are starting to see the impact of climate in their own lives. I don’t “believe” anything, belief belongs in a church. What I am seeing (in some cases with my own eyes) are ever more events, that lend support to the mainstream scientific position while stripping the denial lobby of what little credibility they ever had. You are right Thomas cannot acknowledge that, his standard response is to ask which of those organizations has polled their members to find out their opinions……. rather than reaching a position by looking at the evidence. Can’t think of anything more extreme than Cyclonic activity – hurricanes, tornadoes, cyclones, typhoons, tropical storms … all of which have been on the decline. Ah VD my cheating chum, long time no see! I’m afraid you’ve come rather later to this party. Everyone’s eaten up and gone home. Suggest you switch off the lights on your way out. Fantastic. The world of professional deniers is so tiny,they have to review one another’s work. That explains why you couldn’t fill a tiny theater in one of the world’s leading cities. You fellows are really making your mark! On the brighter side, Tom, your comically gaunt face looks just like the drawings of Don Quixote. You must, must use your natural gifts by starring in your local theater’s next production of Man of La Mancha. Your audience awaits. Wow, a film sold out a tiny cinema on its premier, Did you have much trouble shifting the remaining 4 tickets once you had packed all the invited members of the denial lobby in? Mobius Loop posted a deceptively edited picture of the theatre. I wouldn’t want to be misleading folks by showing only part of the information, (people might think I’d joined you in the denial racket), so here is a section drawing taken through the cinema. As an Engineer I’m sure you would approve of bringing some precision to the discussion – There are 17 rows, which vary between 12 & 13 seats, giving an apparant total of 212 seats. From your pictures there does not appear to be anyone on the upper level, suggesting that C-Fact managed in fact to pack out a grand total of 162 out of 212 seats. Still, part filling a small room is an achievement of sorts I suppose… though when you think about it further, quite a few of that bunch were paid to be there, and there’s a question Thomas, who paid for your jolly to Paris, who bought your cinema ticket?